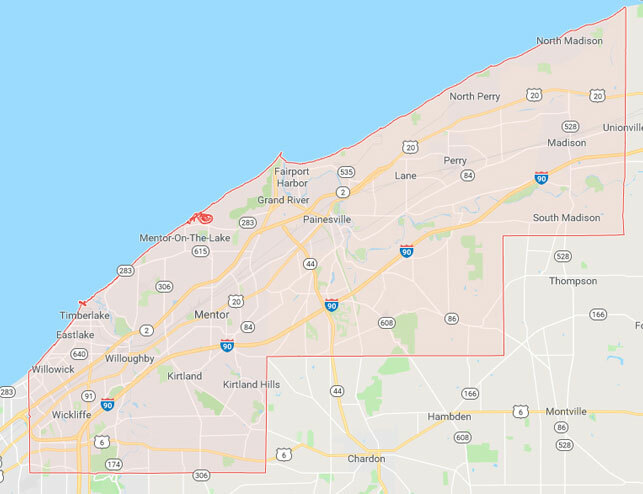 Residents of Lake County are you looking for on-time, safe, reliable airport transportation to CLE? Here at Beachwood Transportaton we take great pride in our fleet of immaculate vehicles and our quality service. Whether you are going to the airport, the casinos, or into downtown Cleveland Beachwood Transportation is here for you. Lake County was officially authorized by the government in Ohio on March 6, 1840. Lake County was originally part of Cuyahoga and Geauga Counties. Lake County is named for Lake Erie which forms the county’s northern border. The county is the smallest in Ohio covering 228 square miles. Living in Lake County has plenty advantages, smaller cities, less congestion, beautiful scenery friendly communities. One of the downsides is a lack of quality, affordable transportation to CLE airport and the many attractions and venues in Cleveland. Beachwood Transportation is working hard to resolve this problem. Do you have an early flight out of CLE, or a night on the town in Cleveland? Let Beachwood Transportation take the stress out of the travel to your destination. Mentor is the largest city (approximately 46,000) in the County followed by Willoughby and then Painesville, the County seat. According to the 2010 census the population of the county was just over 230,000. So, if you are looking for a Mentor taxi to take you to CLE or into Cleveland give us a call and we will take care of the rest. Do you live in the beautiful community of Willoughby or Willoughby Hills? Perhaps you have seen one of Beachwood Transportation offering Willoughby taxi service in your neighborhood. If you are going into Cleveland or CLE and need airport taxi or airport shuttle service just give us a call at (216) 800-6565. Painesville, the county seat is home to not only the county courthouse and government offices it is also home to a growing number of residents. We often provide Painesville taxi service in the community. Eastlake with a population of over 18,000 is a beautiful small city in a mostly rural setting. Looking for an Eastlake cab, give us a call. Willowick ranks 4th best of 100 Ohio cities for low crime rate and quality of life with a population of just over 14,000. Looking for an Willowick taxi – look no further. Kirkland Ohio grew rapidly in the 1830’s as an early Mormon settlement. Kirkland Hills became a separate community from Kirkland long after the main body of Mormons left Ohio in the late 1830’s. Do you need Kirkland taxi service or airport transportation? Beachwood Transportation is very pleased to offer quality airport transportation, taxi and shuttle service to CLE airport. If you are going into Cleveland for a night on the town or to try your luck at one of the casinos give us a call at (216) 800-6565.